Dan Schoening is a talented artist based out of Victoria, British Columbia who has progressed far since graduating from Camosun College‘s Visual Arts program. 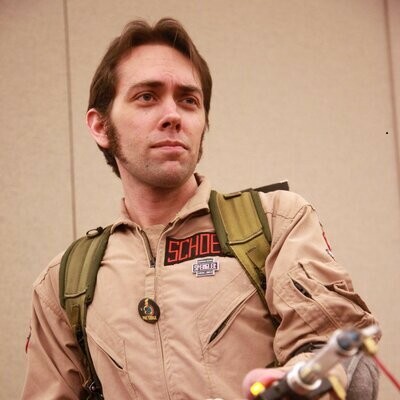 Not only is the main artist for IDW’s Ghostbusters, but also he does work for InLight Entertainment, a local indie video game developer. But his resume does not end there. He’s done illustrations for (to name a few) Random House, DC Comics and APE Entertainment. He’s also very active in the social media front, posting new pictures on deviantART and Twitter. But this is a man who simply loves to draw and to see him pursue his dream and make convention appearances is one of simple pleasure. Business is good for him, and it is a place for him to meet and interact with his fans. He has appeared at many shows, including Emerald City Comicon in the past and will be attending Capital City Comic Con, taking place March 16-18th, 2018! As I predicted way before this event made any official news, any resident artists of this city will be present for this inaugural show. How would you introduce yourself to readers who are not familiar with your works? I’ve had the opportunity to work in many different areas of the entertainment business, from television cartoons, kids learning software, book illustrations, and comics. I’ve worked for companies such as Disney, Nickelodeon, DC Comics and IDW Publishing. I’m passionate about art and I’m always growing and learning new things in the craft. Marc Davis, Milt Kahl, Bruce Timm and Jose Luis Garcia-Lopez were and still are great influences on my art. All of them are amazing talents and inspire me constantly. When you were taking visual arts at Camosun College, were there any challenges since it is a broad program? I was definitely challenged but I enjoy trying new things. Sculpture and photography were the hardest for me, but I learned so much from them that I applied later on in my career. One of those lessons was strong composition, the other was thinking more in volumes, which is important for any type of drawing. Art History, although fascinating at times, made me nod off a bit. It’s tough to stay awake when the lights are off and it’s the fourth hour of slides talking about the meaning of baroque architecture! In terms of past art movements, was there any particular style which resonated with you and influenced your style? I love Monet, Klimt and the Group of Seven. I find myself referencing these artists the most when I’m needing a muse. What are your favourite television shows or movies? Well, Ghostbusters is a favourite film of mine, but above that is Back to the Future. I don’t think I’ve seen another film more. Currently, I’m a big fan of Parks and Rec and My Name is Earl. I don’t have time to watch a lot of TV as I’m drawing so much! LOL. 6. How did you get your gig with IDW and drawing Ghostbusters? Years back my good friend James Eatock, who publishes Cereal Geek magazine wanted to pitch a Ghostbusters comic to IDW. Our pitch wasn’t picked up, but the editor Tom Waltz did contact me shortly after to offer pencil work for the Ghostbusters Halloween One Shot. It was a dream come true as I love GB and my favourite holiday is Halloween. After that issue, I went back to do more books for DC Comics. In the new year, I was contacted again by Tom with the offer to pencil an ongoing. I was hesitant at first as I hadn’t done a lot of comic work, but felt it was an amazing chance to show my love for the property. Was that like a dream come true for you being a fan of the movie? It really was. To this day, I’m honoured to be able to add to the mythos that Ramis, Reitman and Aykroyd created. You mentioned that the Ghostbusters comic is illustrated to mimic the style of the cartoon series mostly due to licensing. How was that decision reached? We aren’t allowed to draw the likenesses of the actors. Since Ghostbusters is a comedy it made sense to keep the lively and humorist feel by making the book look more animated. Even if the characters look cartoony we are able to inject elements of the macabre and scary with the ghosts that appear. Similar to the film in many ways. What kind of style were you going for in DC books preschool line of books? The style for the DC Chapter books was based on the WB animated style, while the Little Golden Books are based on the amazing stylings of Mary Blair. I love doing these books as I have wonderful kids at home that enjoy them immensely. My daughter Paige loves the Wonder Woman books, while Tyson enjoys the Batman ones. If DC Comics asked you to draw Scooby Doo, would you jump at the chance? How about APE Entertainment? What are you working on currently for them? Not at the moment but I have done a few anthology books with them as well as a Kung Fu Panda One Shot. Which characters do you like drawing the most and why? One that I relate to the most. With Ghostbusters it’s Ray; DC Comics, it’s Green Lantern. I love creating and drawing the ghosts in Ghostbusters as well. How different is it to create/illustrate for video games? Creating drawings for video games is more similar to an animated production, in that we draw each frame of the character and things happen in real time. In comics, we can flip around in time and space without having to explain in images where the time has passed. Both are rewarding and different. Are you interested in working on creating full-blown (Flash-based or traditional hand-drawn – cell) cartoons? I’d love to, but they take a lot of time. I’d love to do an animated Ghostbusters show with the comic book designs. I picked up Flash first as I was hired to do animation, which is the main difference between the two programs. Both are vector-based but I find Adobe Flash faster in creating assets. However Flash does crash a lot, LOL. Save your work every 10 mins! Do you have any words of advice for future illustrators to end off with? Do what you love and live what you do. Don’t search for success as if you are enjoying your work it will find you :) oh and draw every day, even if it’s a post-it note doodle.